A range-bound market is one in which price bounces in between a specific high price and low price. The high price acts as a major resistance level in which price can’t seem to break through. Likewise, the low price acts as major support level in which price can’t seem to break as well. Market movement could be classified as horizontal or sideways. One way to determine if the market is ranging is to use the same ADX that we discussed earlier. 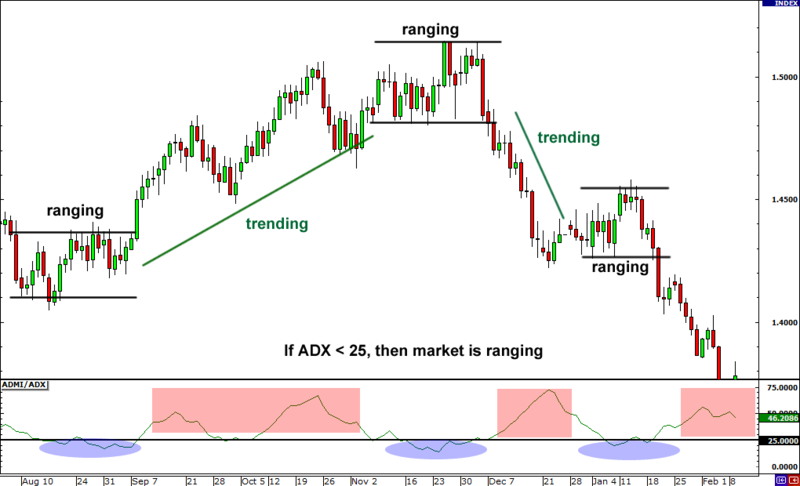 A market is said to be ranging when the ADX is below 25. Remember, as the value of the ADX diminishes, the weaker trend is. In essence, Bollinger bands contract when there is less volatility in the market and expand when there is more volatility. Because of that, Bollinger bands provide a good tool for breakout strategies. When the bands are thin and contracted, volatility is low and there should be little movement of price in one direction. However, when bands start to expand, volatility is increasing and more movement of price in one direction is likely. 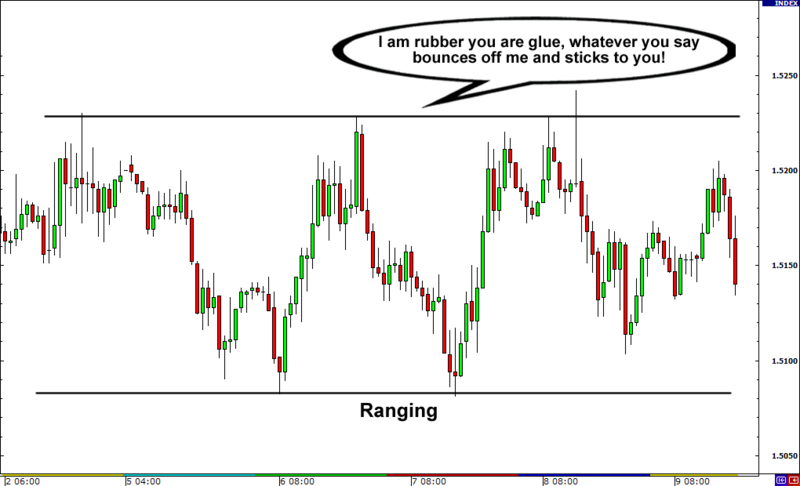 Generally, range trading environments will contain somewhat narrow bands compared to wide bands and form horizontally. In this case, we can see that the Bollinger bands are contracted, as price is just moving within a tight range. The basic idea of a range-bound strategy is that a currency pair has a high and low price that it normally trades between. 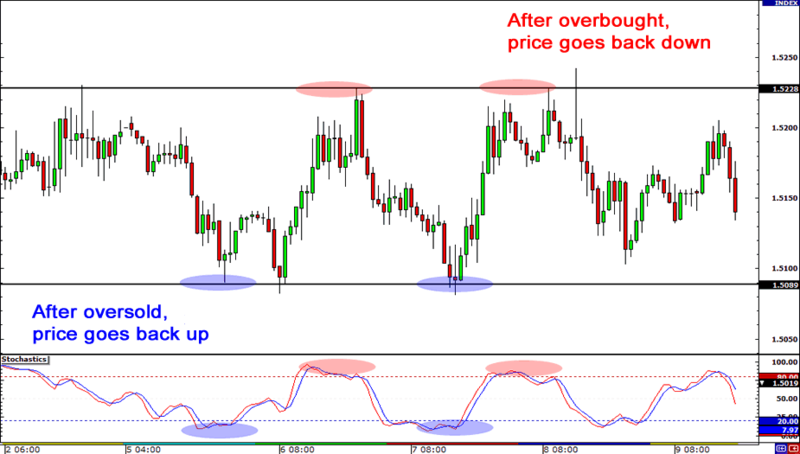 By buying near the low price, the forex trader is hoping to take profit around the high price. By selling near the high price, the trader is hoping to take profit around the low price. 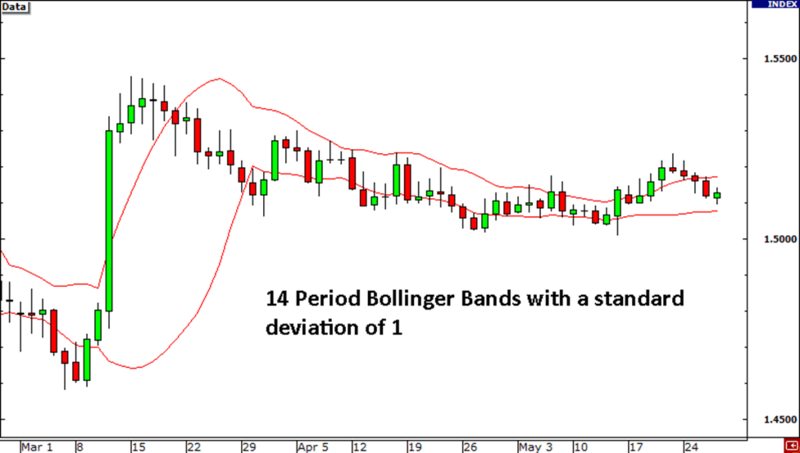 Popular tools to use are channels such as the one shown above and Bollinger bands. Using oscillators, like Stochastic or RSI, will help increase the odds of you finding a turning point in a range as they can identify potentially oversold and overbought conditions. Here’s an example using GBP/USD. Bonus tip: The best pairs for trading range-bound strategies are currency crosses. By crosses, we mean those pairs that do not include the USD as one of the currencies in the pair. One of the most well-known pair for trading ranges is the EUR/CHF. The similar growth rates shared by the European Union and Switzerland pretty much keep the exchange rate of the EUR/CHF stable. Whether you’re trading a pair that’s in a trending or ranging environment, you should take comfort in knowing that you can profit whatever the case may be. Find out how you can pick tops and bottoms in both trending and ranging market environments. By knowing what a trending environment and a range-bound environment are and what they look like, you’ll be able to employ a specific strategy for each. Next Lesson Trend Retracement or Reversal?